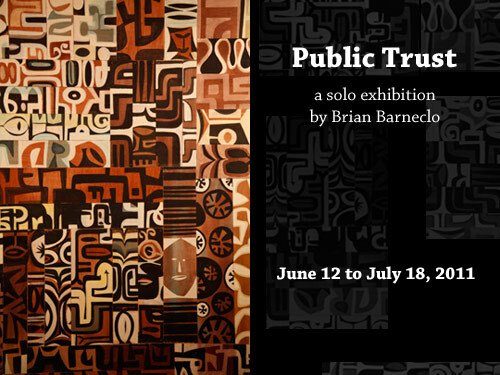 fabric8 presents Public Trust, a solo exhibition of works by San Francisco-based painter and muralist Brian Barneclo. Featuring new paintings, a large-scale wall mosaic, and a preview of the landmark mural that he will create this summer, Public Trust explores the themes which define his current body of work. Barneclo frequently renders cityscapes as he feels they best express his appreciation of simultaneity and multiplicity. Urban vignettes make up larger compositions which touch on his diverse, inter-connected influences, which include city life, lettering, ethnicity, music, and abstraction. Paramount among the influences for Public Trust is the 24,000-square-foot outdoor mural project that Barneclo has been masterminding over the last 3 years, and will paint this summer. The Systems Mural Project, located at 7th and King Streets in the SOMA district, is an idea he came up with while riding his bike past the huge blank wall on Caltrain property. Determined, he has relentlessly formulated the concept behind the enormous work of art while also researching how to independently produce it. Through donations from corporations and private individuals, he has raised much of the $80,000 necessary to complete it in four week's time. Brian Barneclo was born and raised in Indianapolis, then studied painting and art history at Indiana University. He moved to San Francisco in 1996 and began working as a commercial artist and sign painter. He also started to show his paintings in local galleries. His professional and artistic careers merged when he began to receive commissions for murals in both public and private spaces. Barneclo has adorned the walls of many Bay Area's restaurants and streets with his jazzy colorful murals inspired by life in San Francisco -- NoPa Restaurant, Puccini & Pinetti, 83 McAllister Street, the SF Bay Guardian building, the Food Chain Mural @ Foods Co, Escape from New York Pizza (Redwood City), and the Santa Cruz Mural (Santa Cruz). He was named one of San Francisco's top muralists by 7x7 Magazine in 2008, and will certainly remain one after the completion of the Systems Mural. Public Trust was on exhibit from June 12 to July 18, 2011 at fabric8, 3318 22nd Street near Valencia in San Francisco.